Jewelry looks best when it’s cleaned regularly. While we recommend that you bring your jewelry in every 6 months to a year for a professional cleaning and checkup, there are a lot of great ways you can clean your jewelry at home to keep it shining in between visits to the jeweler. Be sure to plug the drain before you start to make sure no small gems are lost. Rinse the jewelry in water. Spray the piece liberally with Windex or a similar glass cleaner (see notes below about which jewelry can handle this type of cleaning). Use a soft bristled toothbrush to scrub the jewelry at all angles. Rinse it off with water again and dry it with a hair dryer to avoid water spots. There are several different, purpose made, jewelry cleaning solutions that you can use. We demonstrate one that is designed to clean and remove tarnish from silver. Check that no gems in the piece are glued in (the cleaner can dissolve the glue and cause the gems to fall out). Put the jewelry in the cleaner for 5 seconds. Remove the piece and immediately rinse off the cleaner. Dry it off with a towel. If all of the tarnish has not been removed, you can repeat the process. However, if you repeat the process too many times or if the jewelry is left in the solution for too long, it can actually oxidize the silver, turning it black. The cleaning solution won’t be able to remove this discoloration. If that happens to you, don’t worry, you can always bring your jewelry to Arden Jewelers and our jewelers can polish off the oxidization for you. We use ultrasonic cleaners everyday at our shop because they are so effective at cleaning jewelry. We also offer an at home version that you can use. These devices are filled with a cleaning solution that is similar to soapy water. Then, high frequency, sonic waves are passed through the solution to dislodge any dirt or grime stuck to the jewelry even in places where you can’t reach with a toothbrush. Keep in mind that this intense vibration can damage some gems and cause gems to come loose in their mountings. So, we recommend that you follow these steps when using an at home ultrasonic. See the list below to make sure that it is safe to use an ultrasonic on your gems. Place the jewelry in the ultrasonic and turn it on for no more than 15 minutes at a time. Check that all gemstones are secure in their mountings when you remove the piece. Watch our video on how to check if your gems are loose for tips on that. A steam cleaner or steamer is another tool that we use everyday at Arden Jewelers. They use a jet of high pressure steam to blast away any remaining dirt or residue left behind after other cleaning techniques are used. The steam is very hot, so always use tongs to hold the piece of jewelry so you don’t get burned. As with the other cleaning methods, see the list below to make sure that your jewelry won’t be damaged by steam cleaning before you try it. Keep in mind that not all metals can be polished. If the piece is gold plated, gold filled, or a base metal (commonly found in costume jewelry) polishing can actually remove the plating and make the metal look worse. As we have mentioned above, cleaning jewelry can be risky and certain gemstones or types of jewelry can be damaged by the cleaning techniques we have demonstrated. The lists below are general guidelines, but there are exceptions to every rule. For example, diamonds are generally extremely durable and safe to clean with all of these methods. However, if a diamond has surface reaching inclusions, there is chance that an ultrasonic cleaner could cause it to crack. So, when in doubt, bring your jewelry in to a knowledgeable professional (preferably a gemologist) to get advice on how to clean it. Windex and Toothbrush: Only use Windex (or glass cleaner) on Diamond, Rubies, and Sapphires. A toothbrush with mild hand soap or delicate jewelry cleaner can be used on most gems, however. Jewelry Cleaning Solutions: Read the label on your cleaning solution to learn what jewelry is safe to clean with it. Ultrasonic: Only use the ultrasonic with the following gems: Diamond, Ruby, Sapphire, Quartz, Topaz, Tourmaline, Aqua, Morganite, Alexandrite, Garnet. Remember the warning above that other factors (like inclusions) can play a role here, so just because a gem is on this list does not mean that it is always safe to put in an ultrasonic. But, in most cases, if a gem is not on this list you should definitely not put it in an ultrasonic. When in doubt, ask your jeweler. Steamer: Only use a steam cleaner on the following gems: Diamond, Ruby, Sapphire, Quartz, Topaz, Tourmaline. All the same caveats mentioned about ultrasonics apply here as well. Polishing Cloth. Only use on solid precious metals like: Sterling Silver, Karat Gold (10k, 14k, 18k, etc. ), Platinum, Palladium. Also, keep in mind that a high percentage of white gold is rhodium plated. Excessive polishing can actually remove the plating and cause the white gold to look yellow. With most gemstones not included on these lists, you can generally use a toothbrush with mild hand soap or delicate jewelry cleaner. However, we recommend that you double check with a jeweler before doing so just to be safe. Also, after any kind of cleaning, gemstones may become loose. Over time, dust and grime can build up in between a gem and its setting. If, for example, a prong has been knocked slightly out of position, the built up dirt can actually be holding the gem in place. After the piece is cleaned, the dirt is no longer there, and the gem can become loose. As we mentioned above with ultrasonics, be sure to check if your gems are loose after cleaning your jewelry. Toothpaste. Since we use a toothbrush to clean jewelry, many people think that toothpaste should be added to the brush to help it clean more effectively. Unfortunately, toothpaste is too abrasive to be used on jewelry and it can actually scratch it. Boiling Water. Putting jewelry in boiling water may help clean it, but it can also damage gemstones due to thermal shock. So, this is definitely not recommended. Soaking in Cleaners. A common practice is to soak jewelry overnight to household cleaners like ammonia. These chemicals can be too harsh for some gems and they can even adversely affect the metals in some jewelry. 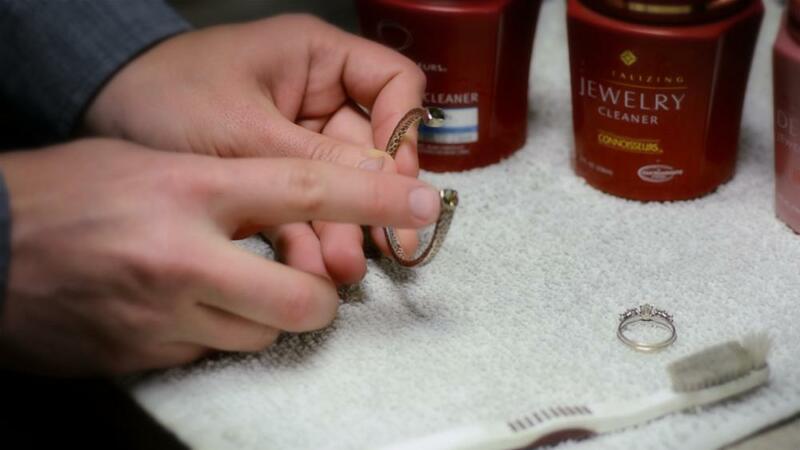 A good rule of thumb is that if your hand can handle the cleaning, your jewelry probably can too. We covered a lot of ground in this video, and we hope we gave you some new techniques to keep your jewelry looking its best. If you’re hungry for more, you can checkout our full article on cleaning and caring for jewelry. As we mentioned above, if you are unsure about whether you can use a cleaning technique on your jewelry, or if something didn’t quite work, or if it’s just time for a professional cleaning, we would love to help. Drop us a line or stop by Arden Jewelers anytime and our gemologists will be happy to help with your specific jewelry needs.